Welcome to our brilliant new collection of Jigsawdoku Puzzles! If you're a fan of standard 9x9 sudoku but feel it's time for a change, check out one of our many sudoku variants. 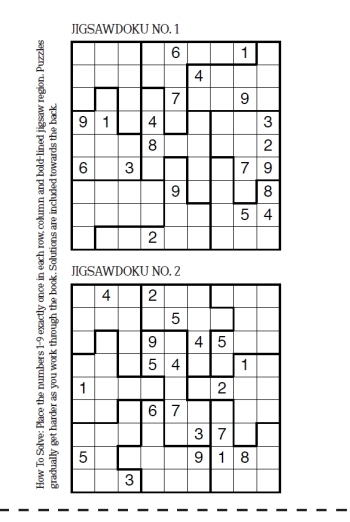 Out of those various creations, one of the best variants is undoubtedly jigsaw sudoku, also known as irregular sudoku. It has all the good qualities of sudoku whilst adding something novel into the solving mix - the fact that there are lots of different types of grid patterns, which all solve in a slightly different way whilst using the same familiar sudoku logic. 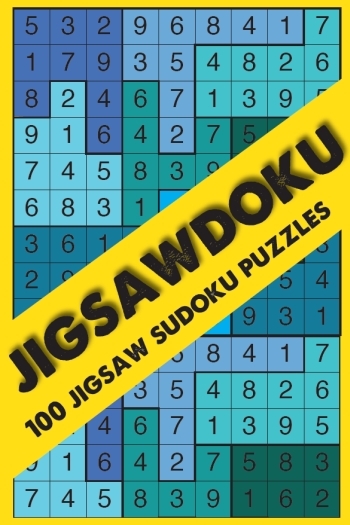 This jigsaw sudoku book features an all-new collection of 100 fantastic puzzles. They require logic and nothing more to solve - no guessing is ever required. If you like standard sudoku, you should enjoy this book. These puzzles tend to be slightly harder to solve than ordinary sudoku and take longer to solve as a result, and there is a great sense of satisfaction in cracking a particularly tough puzzle. As with all our puzzle books, full solutions are included at the back for you to check your answer or even if you fancy cheating a little!